Brie Larson is kicking off her publicity tour as the first female lead in a Marvel Comics movie with "Captain Marvel." 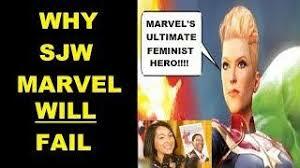 But she's facing withering backlash and a boycott from some fans who are turned off by her man-hating rhetoric. The boycott was launched by conservative author Jack Posobiec, a correspondent with One America News. Posobiec started the Twitter hashtag Alita Challenge, urging his legion of social media followers to boycott "Captain Marvel" and see "Alita: Battle Angel" instead. Posobiec told CCN that Larson's anti-male rhetoric and Marvel Studio's injection of leftist politics into the action film is insulting and unwarranted. He underscored that movie fans go to the theater to be entertained — not to be indoctrinated and brainwashed with left-wing propaganda. Vietnam Seeks Justice From Monsanto!